and the following accessories: 40 oz food proceesor, 16 oz chopper. 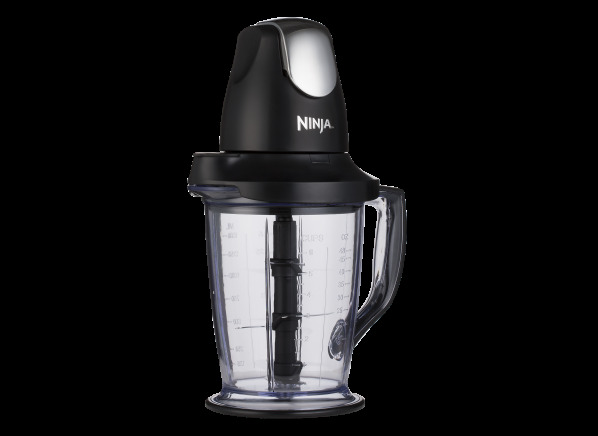 The Ninja Master Prep Professional QB1004 is part of the Blender test program at Consumer Reports. In our lab tests, Blender models like the Master Prep Professional QB1004 are rated on multiple criteria, such as those listed below. Predicted reliability: Predicted reliability icons are based on estimated breakage rates for newly purchased blenders, not under service contract, within the first four years of ownership. Icy drinks (Smoothies): Smoothness and thickness of non-alcoholic pina coladas are determined using assorted sieve sizes. Blenders that do well for icy drinks also do well for smoothies. Results in the following chart are gathered from Consumer Reports’ 2018 Summer Survey of 24,544 full-sized blenders, owned by members who purchased a new machine between 2008 and 2018. Our predicted reliability ratings are based on a statistical model that estimates breakage rates within the first 4 years of ownership, for blenders that are not covered by an extended warranty or service contract. We also adjust for the median frequency of use per month. The median number of days blenders are used is 2 to 3 days per month. Higher ratings are indicative of better reliability. Brands receiving a red or orange rating cannot be recommended by CR at this time. Our owner satisfaction ratings are based on the proportion of members who are extremely likely to recommend their blender to friends and family. Accessories Accessories Additional items either found in box or on the model. Glass jar Glass jar Heavy and stable, can be put in the dishwasher, and don't get cloudy or stained. Plastic jar Plastic jar Lighter and easier to handle than glass, but that makes them more likely to wobble or tip over. Stainless-steel jar Stainless-steel jar Stylish, sturdy, lighter than glass, and often dishwasher-safe, but you can't see the contents. Wattage Wattage How many watts each blender is. Some were converted from horse power or amps to watts. Speeds Speeds The number of speed settings the model has. Weight (lbs.) Weight Weight of the jar, lid and base. Pulse Pulse Identifies that the blender has a pulse feature, which provides the user with greater control during use and prevents overblending. Removable blade Removable blade A blade that can be removed makes cleaning easier. Controls Controls Indicates the type of controls the blender has. Height (in.) Height The height of the blender. Jar weight (lbs.) Jar weight Weight of the jar and lid.